Click on pictures to see a larger view. Join us in Libby, Montana to celebrate the annual Libby Logger Days. We strongly recommend you book your lodging accommodations early for these dates in Libby. Logger Days is four days of family fun, celebrating the logging heritage of the Libby area. There is a carnival, live music all three nights, adult logging events, children's logging events, king and queen coronation, a parade, lawn mower races, Bull/Bullette of the Woods, tug-a-war, fireworks on Friday night and a 10-km run. 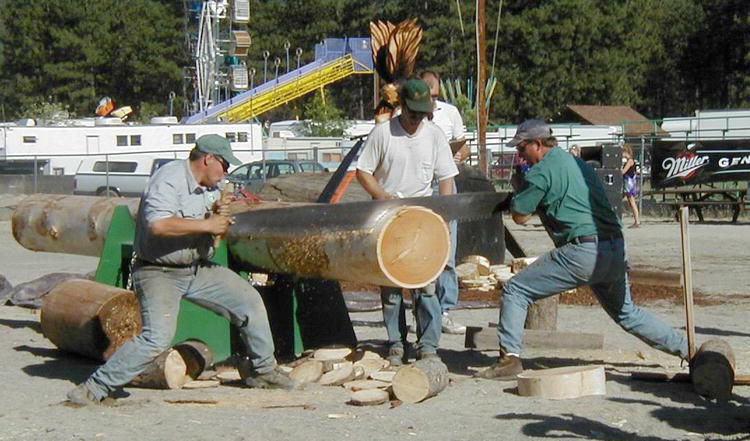 The weekend is filled with many different fun logging competitions. Logging events include springboard chop, double buck, single buck, donut stacking, ax throwing, log rolling, Ma & Pa relay, PeeVee roll, choker set, and more to showcase the skills of men and women who work in the industry. Logger Days Buttons are required for entrance to Grounds. Buttons allow entrance to all festivities. Button prices are $7 in advance or $12 at the gate. Children under the age of 12 are free. All page content copyright 2015. All rights reserved. Photos by LibbyMT.com unless otherwise credited.